Are you a coffee or a tea person? I love coffee, both for its flavor and for the caffeine. Mornings don’t officially start until I’ve had my first mug full of espresso strength coffee. Tea is a different story. I drink tea to relax. Hot or cold, tea is soothing. Even tea with caffeine relaxes me. My favorite teas are fruity or floral. 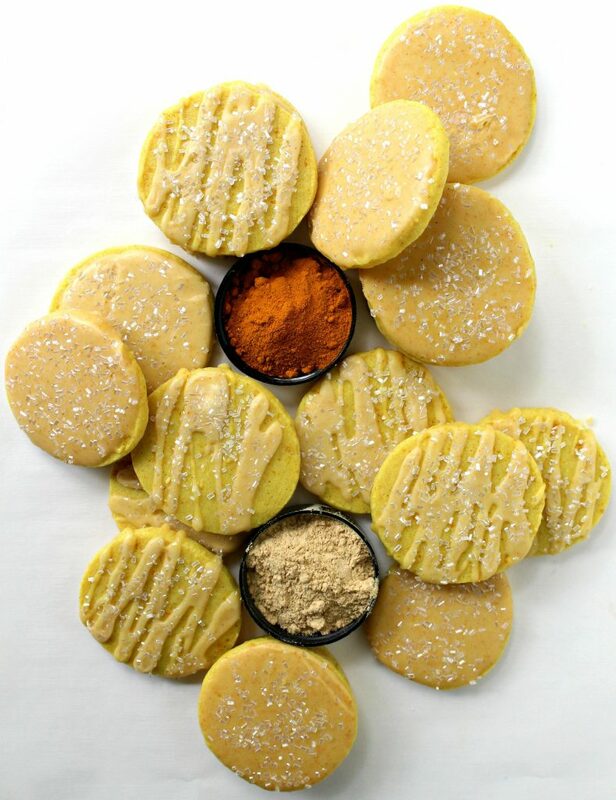 There is just enough ginger for flavor without being spicy, and the turmeric mostly adds color and smoothness. I hope the claims that these herbs are good for you are true, because I have been drinking this refreshing blend by the gallon! 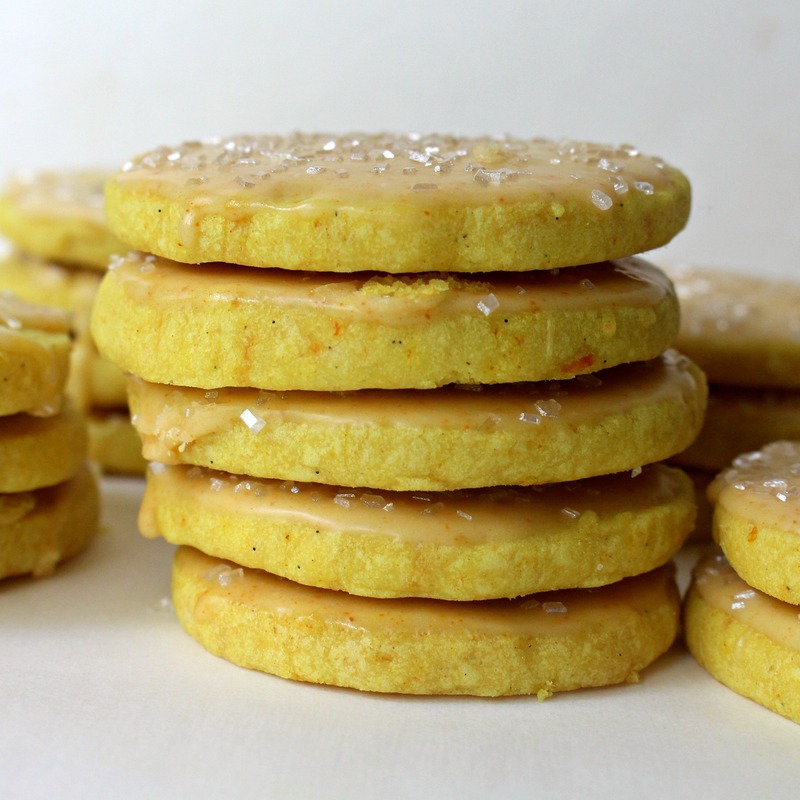 I’m so taken by this flavor combination, that I recreated it in Orange Ginger Turmeric Cookies! The no fuss dough for Orange Ginger Turmeric Cookies is super simple to throw together in a mixer or food processor. Once chilled, the log of slice-and-bake dough can be baked all at once, or stored in the freezer to slice a few cookies and bake when needed. The drizzled glaze, sprinkled with decorating sugar, gives Orange Ginger Turmeric Cookies a lace-like look. One of my taste testers said the cookies looked like pieces of a wedding dress. That made me smile. Generally, I have found that confectioners’ sugar glaze, once completely dried, holds up well to shipping, even in the summer. However, this glaze is made with juice and can start to change color after a week. 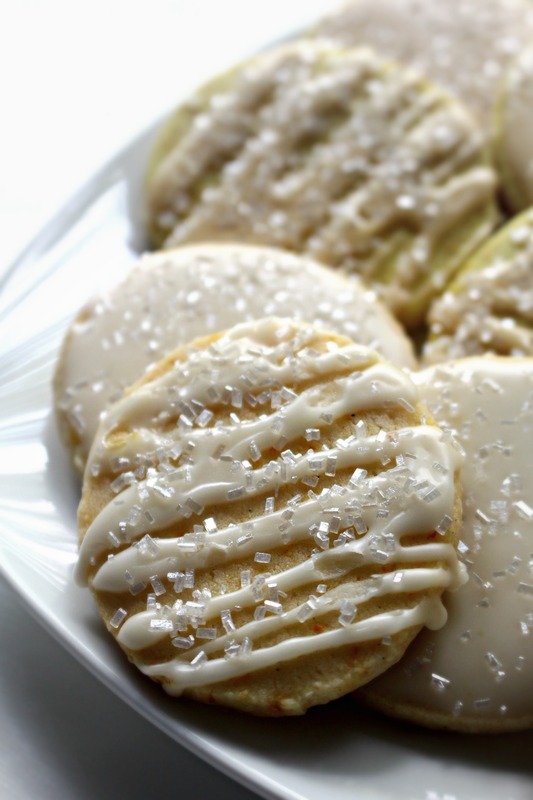 For longer storage time of up to two weeks, skip the glaze and just sprinkle the cookies with sugar before baking. Orange Ginger Turmeric Cookies are lovely summer cookies. The bright refreshing flavors are perfect for a warm weather snack. 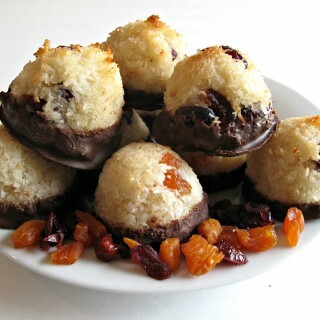 They are also an easy cookie to make ahead and bake as needed for guests or care packages. Make sure to have a few of these cookie dough logs in your freezer for whenever you need a bit of sunshine! NOTE: If you don’t want the yellow color in the dough or icing, simply leave out the turmeric. I made a two batches; one with turmeric and one without. The white glaze in some of the photos shows the turmeric-less batch. In the bowl of an electric mixer (or food processor), combine the flour, confectioners’ sugar, baking powder, salt, orange zest, ginger, and turmeric (optional). Add the pieces of butter and mix until the butter is in small pieces throughout the flour mixture. In a small bowl, stir together the orange juice and vanilla. Pour into the mixer bowl and mix just until the dough forms. Place the dough on a sheet of parchment paper and roll into an 8” log. Place the log into the center of the paper. 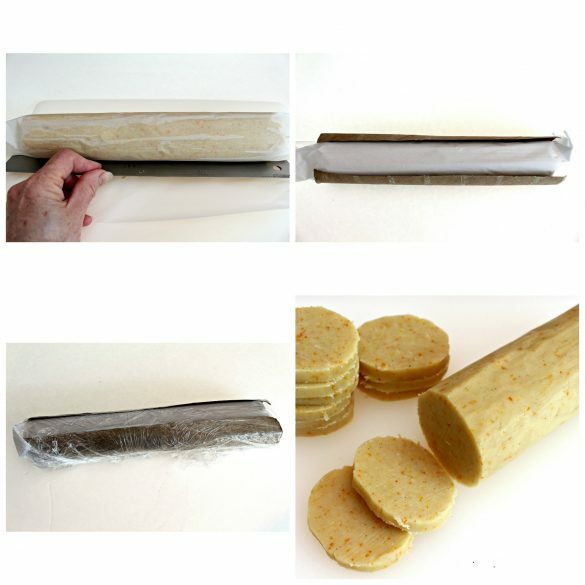 Fold the parchment over the dough and push a ruler edge or dough scraper against the bottom edge of the log where it meets the parchment to remove air pockets and compress the dough into a log about 10” long. Roll-up the log in the parchment paper, then place into a paper towel tube cut open lengthwise (to keep the bottom of the log rounded). Wrap the tube encased dough in plastic wrap and chill for at least 2 hours. When ready to bake: Preheat oven to 325° F. Line a baking sheet with parchment paper. Unwrap the dough and slice ¼” thick. Place on prepared baking sheet about 1” apart. Bake for 12-15 minutes, or just until the bottom edges begin to turn golden. The surface should not brown. Remove from the oven and transfer the cookies to a wire rack to cool completely. Prepare glaze: In a small bowl, combine the confectioners’ sugar, ginger, and turmeric (optional). Add the orange juice, 1 teaspoon at a time, while mixing until a drizzling/spreading consistency is achieved. With the wire cooling rack positioned over a sheet of wax paper (to catch drips) drizzle or spread the glaze over a few cookies at a time. Sprinkle immediately with large crystal decorating sugar. Allow the glaze to set completely for several hours before storing the cookies. Store at room temperature in an airtight container. Glazed cookies stay fresh for at least 1 week. Cookies without glaze stay fresh for up to 2 weeks. Double wrap pairs of cookies, with bottoms together, in plastic wrap. Stack bundles in airtight containers or freezer weight ziplock bags. Another beautiful cookie – with fascinating flavors Wendy! I drink both tea and coffee and could enjoy a couple of these cookies with my cup-o-Joe right now 🙂 Have a lovely weekend! Thanks, Tricia! 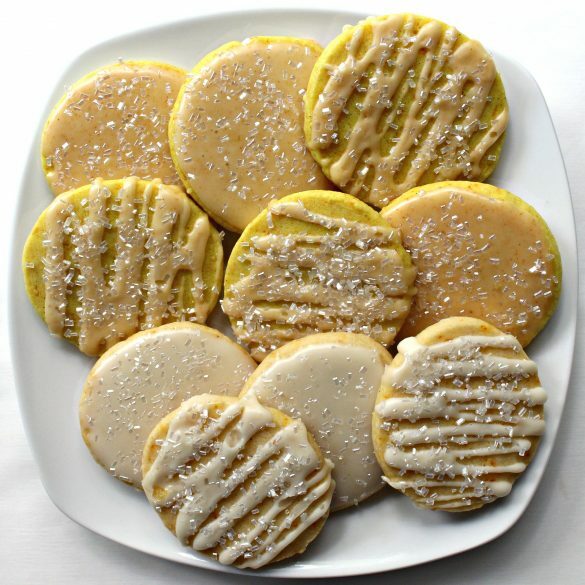 I just adapted the flavors I was loving in my tea to a butter cookie. They are great with tea or coffee! Wishing you a great weekend too! What a fun and delicious combination of flavors Wendy. I’ll be looking for that tea at TJ’s! oh, what a fab cookie! Such a creative and mouth-watering flavour combo. Thank you! I fell in love with this flavor combination in a cup of tea and it translates wonderfully into a cookie! These are my perfect cookie! I don’t make cookies often, but when they have added benefits of turmeric, I think I should! Pinned for later, Thanks! I am excited to try these. I have been wanting to add more turmeric to my diet because of its health benefits. Thanks for sharing this. 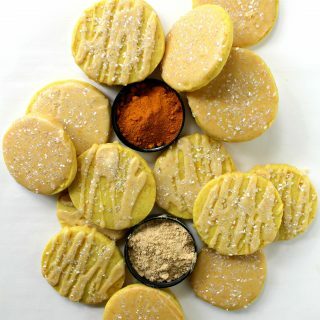 Orange, Ginger and Turmeric what a different combination for your delicious looking cookies. I will be trying these very soon. I am pinning these! Thanks so much for sharing your post with us at Full Plate Thursday. Have a great weekend and come back to see us real soon! Thanks, Miz Helen. I fell in love with this interesting flavor combo in my new favorite tea. It tastes great in cookies too! 🙂 Thanks for pinning! I hope you enjoy the cookies! I love the unusual flavour combinations in these cookies the Ginger and Tumeric. Thanks so much for linking up and sharing with us at #overthemoon link party. I’ve shared on social media. Have a great week and see you at the next OTM. Thank you, Sue! 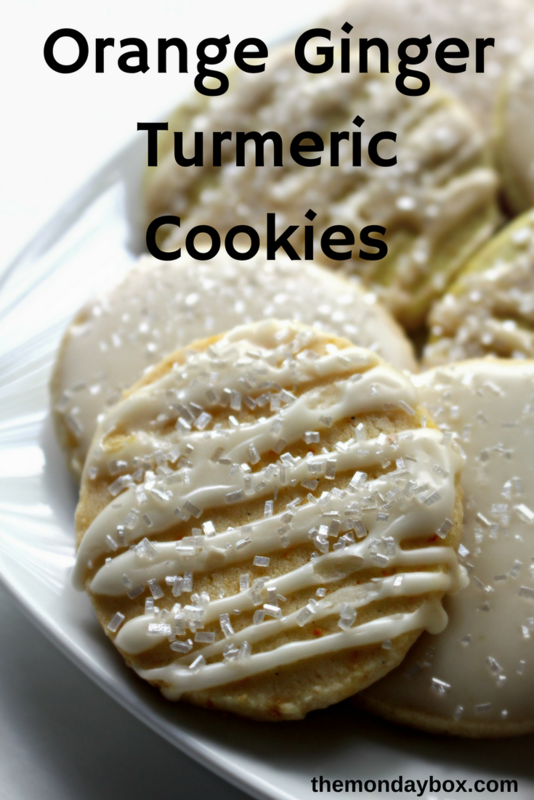 My love of ginger turmeric tea overflowed into these cookies! 🙂 Thanks for pinning and for hosting Over The Moon! 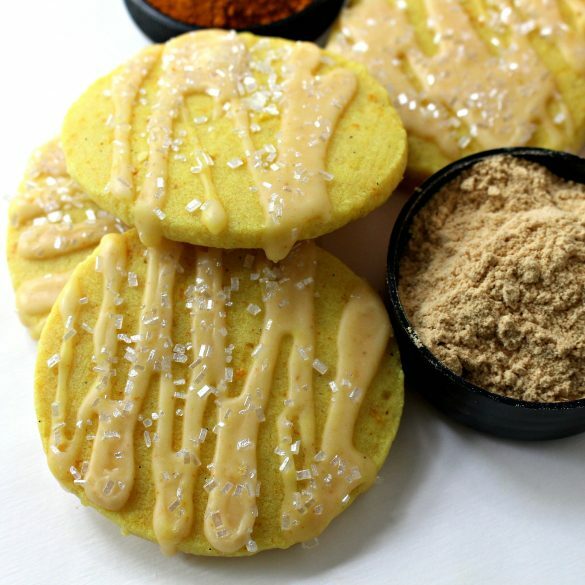 Just made these with the turmeric. Absolutely delicious. I made the recipe as written and it looked like biscuit dough after you have cut in the butter! I added an egg and more orange juice and it formed a dough. They still turned out great after these modifications. I will make these again, but I will probably double the turmeric and triple the ginger as those flavours didn’t come through in the final cookie at all. They only tasted like orange, delicious orange though. Hi, Alanna. I am not sure what you mean by the dough looking like biscuit dough. It should be crumbly after cutting in the butter. At that point the juice is added (you said “more juice” so I am not sure when you added the original amount). Given a minute or two, the amount of liquid in the recipe from the juice and vanilla, will cause the dough to come together. If it did not come together, I wonder how you measured your sugar and flour. Did you spoon the ingredients into the measuring cup? Scooping the ingredients can cause over filling. Weight measurements would be preferable but many people aren’t used to measuring that way. Certainly, adapting the spices to your tastes is always recommended. I will say though, that the extra orange juice probably upped the orange flavor! I am glad the cookies were tasty!